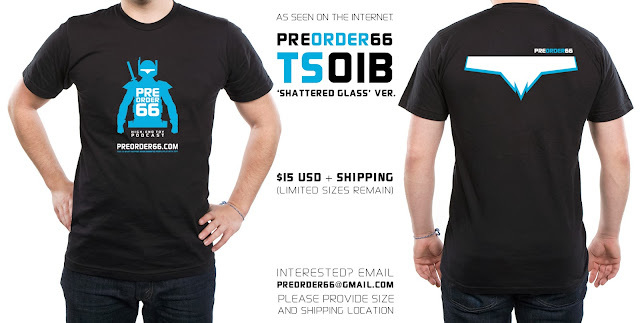 PREORDER66: PREORDER66 - THE SHIRT. AS SEEN ON THE INTERNET. PREORDER66 - THE SHIRT. AS SEEN ON THE INTERNET. What's that? You missed a chance to pick up an OFFICIAL PREORDER66 SHIRT at the last robit convention you attended? Wait, you didn't go? Or Crasis was too incoherent to take your order? Fear not, loyal 66er (66ite? Human? Clanker? Thing? ), for we're offering these fabric fashion faux pas again, just in time for the holidays. Find out how you can dress like a TROO FAN after the jump. Oh, shitting dicknipples! A 66 SHIRT? I want one! How much? $15 USD + Shipping (usually around $2-4 within the US. International gets a little more ish). Okay, jerks. Do you take PayPal? That's all we take. Sorry. We're, umm, charmingly low-tech. Ah, but there's a twist, right?! Well, yeah. Sort of. Limited quantities remain. Please email us to inquire if your shirt size is still kicking around. We'll try our best to find either a TS01 or TS01B option that fits your needs. Please include your SIZE and MAILING LOCATION so we can give a shipping quote. Wait, what's with all those freaky letters and numbers? What does all that mean? Ah! Well, TS01, the very first PO66 TeeShirt, was printed in two formats! The original design featured the VISOR design on the front, with the MASCOT LOGO on the back, the original intent for the design. Some fans (calmly and rationally) exclaimed they wanted a reversal of the design, with the FRONT of the shirt bearing the full 66 logo/mascot. So, BOOM. TS01B. Everyone is happy. Except Darwin - these don't come in non-human sizes. Sorry, pal. Why do you have this weird code system in place, Crasis? VARIANT EDITION! IT'LL BE WORTH SOMETHING! WE DON'T PROMISE! Trust me people you need this shirt. Its one of my favorites and has officially become one of my go to convention shirts. 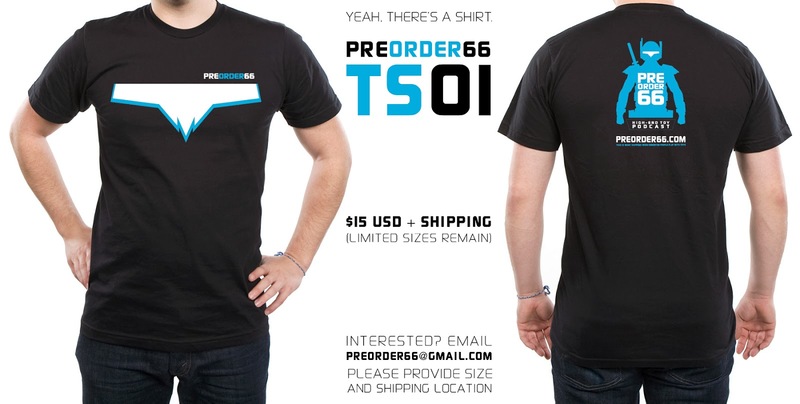 Ive even had people ask about it and I explain to them what PO66 is and tell them to join the movement of awesomeness. I cant say enough about this shirt. BUY IT WITH YOUR MONEY!!!! EP53 IS LIVE! HOW DO YOU PRONOUNCE IT? Just What ARE "BUTTERSHOES," Anyway?? ?